Although we are having warm weather so far this fall, I know the cold weather is coming. The leaves are started to turn here in Ohio, and you can't walk in to any store without seeing pumpkin spice everywhere. I love the crisp fall air, but I don't like being cold. I hate the cold so much that I've decided that my youngest will go to college in Florida so I can go with her. When she graduates, I'll be a snow bird and live in Florida all winter. In the summer, I'll spend two months with each child here in Ohio. It's perfect. I just hope my kids think the same. 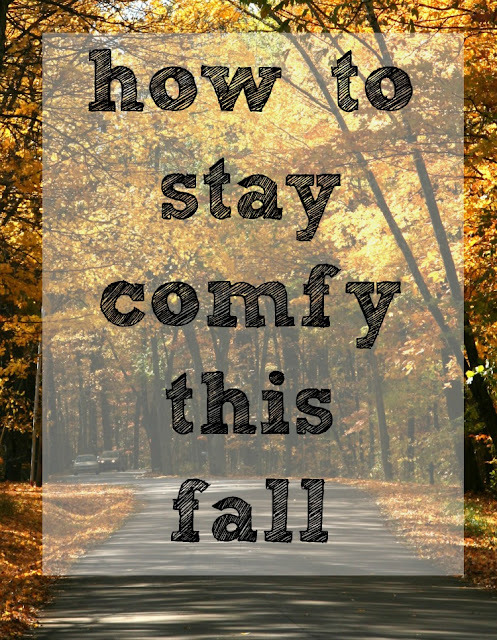 Until then, here are my top tips to stay comfortable in the fall. I always layer my clothes in the winter. I don't like wearing bulky clothes, but I have found that wearing a tank top under my shirts keeps me warmer without adding extra bulk. Scarves are not only fashionable, but they keep you really warm. Just adding a scarf can make all the difference in keeping warm. Pick up a few cute ones to wear with your outfits inside to keep you warmer in the house too. Keeping your core warm helps your entire body stay warm. You'll stay warm and cozy and look great with a trendy vest. Leather isn't very bulky, but it helps you stay warm. Leather is also very popular right now, so it will be easy to find in most stores. Longer coats stop a draft from creeping up your back. Look for a peacoat that stops about mid-thigh to keep you warm when you're outside. Tall boots are so popular, and they keep your legs really warm. I like to wear tights under my jeans when I'll be outside a lot. It really makes a difference in keeping me warm. Do you want to know what else keeps me comfy and confident? U by Kotex® has some serious protection for unexpected surprises. When I don't have to worry about wardrobe mishaps, I'm seriously comfortable! U by Kotex® Lightdays® Liners are thin and flex with my body, so they are comfortable, and they work great at keeping me dry. Want to try Kotex for yourself? Click here for a coupon for your next purchase!